City Plan Commission has concerns, but advances Royal Capital's project design. Park 7 Lofts. Rendering by Engberg Anderson. A proposed apartment building for the arena district received a cautious thumbs up from the City Plan Commission. 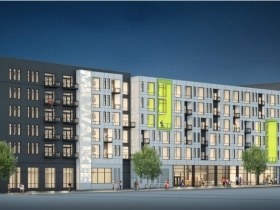 Under consideration was the design of the six-story, 107-unit Park 7 Lofts that would be built between W. Juneau Ave. and W. McKinley Ave. on the east side of N. 6th St. But instead of discussing the design, the public hearing on the project focused in on the affordability of the units. Stokes motioned to approve the deal, with commissioner Joaquin Altoro seconding the motion. But Altoro stated that the commission needs to begin having more discussions around affordable housing, particularly for downtown developments. The rest of the commissioners unanimously supported the proposal, which will next go before the Common Council’s Zoning, Neighborhoods & Development Committee. Royal Capital Group secured the deal as part of a highly competitive bidding process the Bucks held for the site. Milwaukee Bucks president Peter Feigin was in attendance at the hearing, but did not speak. The Bucks’ real estate arm will have an equity investment in the project. When the Bucks announced Royal Capital Group as their development partner in February the project was originally planned as only 90 units. The unit count has since grown to 107 units, but still includes only studio, one- and two-bedroom units. In a follow-up interview Newell noted that the unit increase comes from changing the unit mix. Because it is being developed on former county-owned land in the Park East, the project will need to pay union-level wages to those working on the project. 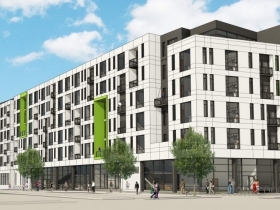 The developers, at the project’s announcement in February, also announced that they’re voluntarily complying with the city’s Residential Preference Program and Small Business Enterprise programs. As such, Royal Capital will need to have 40 percent of the project’s work hours completed by those certified as under- or unemployed by the city as well as having 25 percent of the project’s contracting led by minority-owned small businesses. Royal Capital has been pursuing a unique financing package for some time, but its representatives declined to discuss the financing after today’s vote. A residential entrance would be built along W. Juneau Ave. on the south-end of the building. Three street-level commercial spaces are planned along N. 6th St., with targeted uses including a lounge and fitness center. Due to the unique nature of the site, the building would be a three-sided, triangular-shaped structure. The building would not have any windows on its eastern facade, as it will immediately border a parking garage. The building does not include any parking, but would take advantage of the parking garage. That garage, being built for the new arena, is to consist of 1,243 stalls. The garage has a budget of $43 million, with $35 million coming from the city via a tax-incremental financing (TIF) district and $8 million via a developer-financed TIF district. The Bucks and city will split revenue from the structure. A 80-foot tall, vertical sign spelling out MILWAUKEE would be included on the building’s west facade, carrying forward a planned element of the parking garage that will be covered by the project. 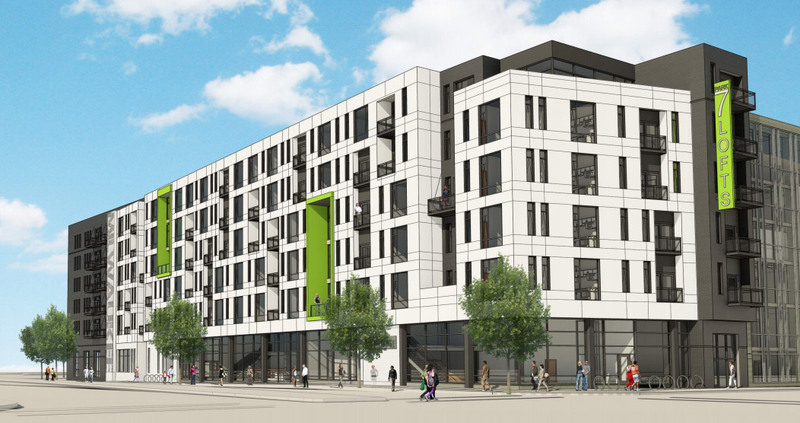 According to design documents, two 30-foot tall blade signs would read “Park 7 Lofts” at each end of the building. 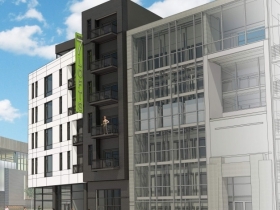 In February, Newell said that tenant-only amenities would include a fitness center, club room, rooftop terrace and a series of lounges. The project is being designed by Engberg Anderson. A conceptual design for the project, part of a broader General Planned Development, was approved for the project more than a year ago. The development team appeared before the City Plan Commission today to start the zoning approval process for a Detailed Planned Development. That law might not apply to pre-existing development agreements. Rich, as I read Act 3 (your link), it prevents the County from requiring union labor, BUT it says nothing about setting minimum wage levels (even “union-level wages”, so long as the County does not require that the workers be unionized). Jeramey, when you say “Due to the unique nature of the site, the building would be a three-sided, triangular-shaped structure” what is the unique nature you’re referring to. I thought a rectangular lot was left once the parking structure was complete, no? Curious what the unique aspect is. @AG – N 6th St runs at an angle on the site’s western edge. The building will be wider on the south than on the north. It’s subtle, but impacts the design. Interesting, I knew it angled but didn’t think it was enough to prompt or inspire a triangular building. Thanks for responding!